Star Details. I didn’t originally plan to add the small Crumb Cake stars in the background of my project. I so loved the look of the adorable star when I stamped it in Crushed Curry for the tree topper that I knew it would help me create a faint, but interested, backdrop for this card. Added Panel. I originally mounted the tree (with star, stand and sentiment) on a Crumb Cake base (with the stamped stars). After it was all glued down, I bumped the corner of the card on my desk – there was no way I could edit out that bump from my photo, so I cropped 1/4″ off each side and then mounted it on a piece of Whisper White. I’m SO HAPPY with that accident – I think the card-making gods were looking out for me. Cheer All Year stamp set. This is one of the very first stamp sets I inked up from Stampin’ Up!’s 2015 Holiday Catalog. I love it! 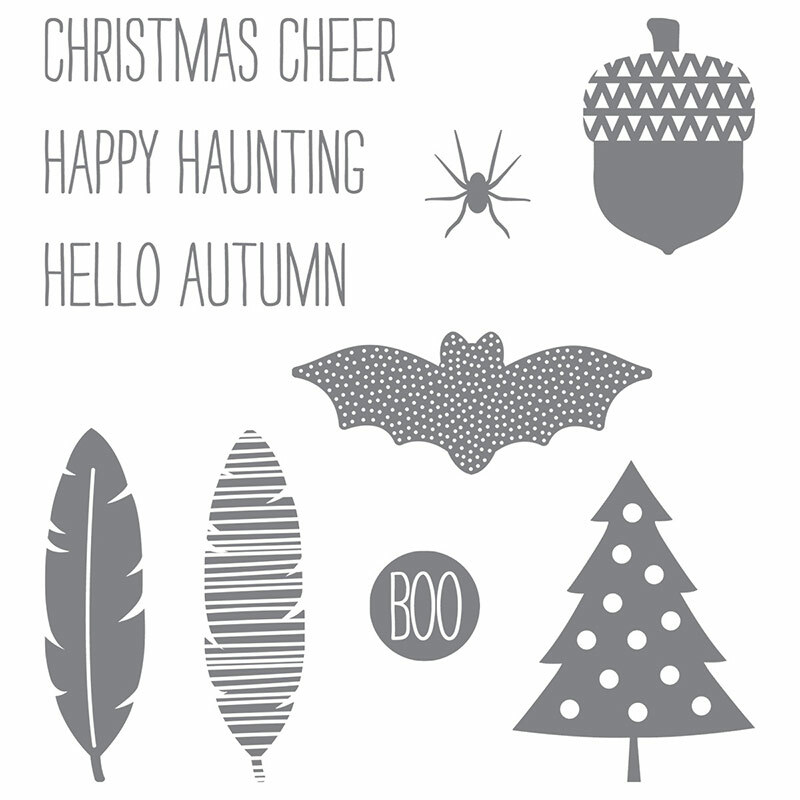 Not only are the sentiments great for Halloween, Thanksgiving and Christmas, but the images are super-adorable. I’ve been drawn to this bold Christmas tree from the start, but today is the first day I’ve actually inked it up. This bold image needed a bold color, so Cucumber Crush was a perfect choice. Cheer All Year stamp set, Stampin’ Up! Festive Christmas Colors. This bright and sassy tree needed a fun accent with the pop of Rose Red, but it also needed a soft neutral that allowed it to really pop. While this color combination isn’t a traditional Christmas combination (see my post on color combinations for Christmas here), it certainly fits well with these fun images, don’t you think? I hope you’ll pop over to the Freshly Made Sketches site to see the cards by the design team members and to play along with this week’s challenge. What could be sweeter! 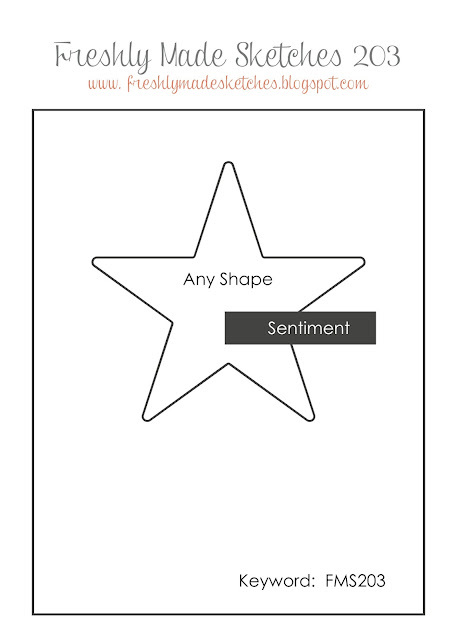 I love the soft spray of stars in the background and your cool tip for the sentiment/punch. Love….LOVE! So simple, so sweet, so WOW! My kinda card….you can just mail it to me now and then I will smile even more! Wow, again, you used Rose Red for Christmas and I keep being surprised at how great it looks. I can’t imagine the card looking so terrific without that little pop o’ color! Nicely done, as always. Love! I forget about Rose Red. Need to pull that ink pad out and play! I love the daily inspiration! Today was a real treat as I love your color inspirations, especially now since, Stampin’ Up! no longer carries the color coach. The beautiful clean and simple card, and the idea for changing the size of the Washi Label punch pieces made today’s blog post a triple treat! Love the pretty Christmas Tree against the Crumb Cake panel, this makes it really pop as the Rose Red sentiment, really beautiful. Great simple card. Love the color combinations too! Love the tree. Love the colors. I’ve the simplicity. Love, love, love it! Love the card and washi tape punch tip! I love the color combo and the stars in the background. Thanks for the tip about an alternate way to use the punch. You come up with the most helpful tips. Aaahhh. Christmas trees and Crumb Cake are a total win in my book! Love this! Thanks for playing along with us at Freshly Made Sketches! This is a perfectly clean festive card! I love your choice of stamps and colours Brian. Thanks for joining us at FMS this week!